Access POS offers a comprehensive "Manual Magazine In" Software module that can either be purchased as standalone or fully integrated into our Newsagency POS Software. The Newsagency POS Software - Manual Magazines In module, offers the same functionality as the "Electronic Magazines (XchangeIT)" Software module, although magazine invoices from the two main distributors (Gordon & Gotch and Network Services) have to be manually entered from a supplied paper invoice instead of being electronically imported as per "Electronic Magazines (XchangeIT)". Magazine paper invoices are typically suppied with a delivery of magazines. They can then be manually entered into the "Manual Magazine In" Software. As this is done, customer put-aways are allocated with automatic email reminders sent to your customers, Subagent orders are charged then posted on the delivery slip and shop stock is allocated. Labels appropriate for each of the processes are automatically printed (a Thermal Label Printer is required). Magazine labels are printed with an issue specific barcode and other relevant information (eg. Return Dates, Supplier Code etc) to assist in controlling magazine 'movement' up until the return stage for unsold stock. When magazine issues are due for return, these can be scanned into the Magazine Management Software. At the time of scanning in returns, the software will inform you of the quantity that is expected to be returned. This calculated value assists you in completing an accurate return. ie. receiving all credits due. 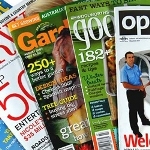 You can purchase the Manual Magazines In Software as either standalone or fully integrated into Newsagency POS Software. You only need to purchase a single license regardless of how many computers you have with the core Newsagency POS Software as long as the computers form a single LAN (Local Area Network) / (Single Retail Store). If purchased standalone, you would need to purchase a quantity of licenses that match the number of computers it will be installed on.